Like Rocky Balboa in 2006, John Rambo made his triumphant return to cinema in January of this year; it was awesome. Now, the film has arrived on DVD. Is the home video presentation as awesome as the film? Find out in my review of Rambo: 2-Disc Special Edition. The Rambo series eventually lost touch with its original purpose; First Blood was the story of a man lost after a horrific war. Three films later, Sylvester Stallone re-uses that theme. Rambo hates the world, but his journey tempts him to re-join it. That’s why the new film succeeds. And even if you don’t have the stomach for it, the action scenes are, as we’ve come to expect from this series, spectacular. There’s a great stealth scene, much like the scene in Rambo 2 where he attempts to save the POW’s. There’s some phenomenal jungle chases, and a final battle that sends this series out with a bang. One thing that makes these action scenes so thrilling is that the effects are done practically. I’m sure an exploding head needed some CGI work, but most of it was obviously done on set, and that makes it all the more realistic. Stallone is a great director, and keeps the action going at a steady pace. Overall, Rambo is a triumph. It’s certainly the deepest of the sequels, (especially with the brilliant ending that brings the series full circle) and harkens back to First Blood. Still, I can’t get over how bad this title is. I’m trying to talk about the character and the title of the film, and they’re the same word. It makes it hard trying to write a review. The film is also a tad short for my likeing; at just 80 minutes without credits, it feels over before it begins. Oh well. The important thing here is that this is a powerful, provocative, and thrilling action flick. Rambo gets my high recommendation. Rambo is a very visual film; shot almost entirely outdoors on location, there’s plenty of beautiful cinematography to behold, and for the most part, the DVD recreates the theatrical experience very well. Colors are strong and accurate throughout, with flesh tones being very realistic. Detail is very sharp in most scenes, especially in close ups. Large landscape scenes and faraway shots, however, are soft and somewhat muddy, and far-off shots of faces lack detail. But in those fast paced action scenes, the image never clouds up, and for the most part, this is a top notch image that serves the film well. The audio is a home run, however. Every sound effect is crisp and realistic; every bullet and drop of rain comes through clearly. The music never overpowers but is never too quiet, and dialogue always comes through clear. This audio tracks will put you right in the action, which is exactly what it should do. The A/V presentation isn’t reference quality, but it won’t disappoint fans of the film. 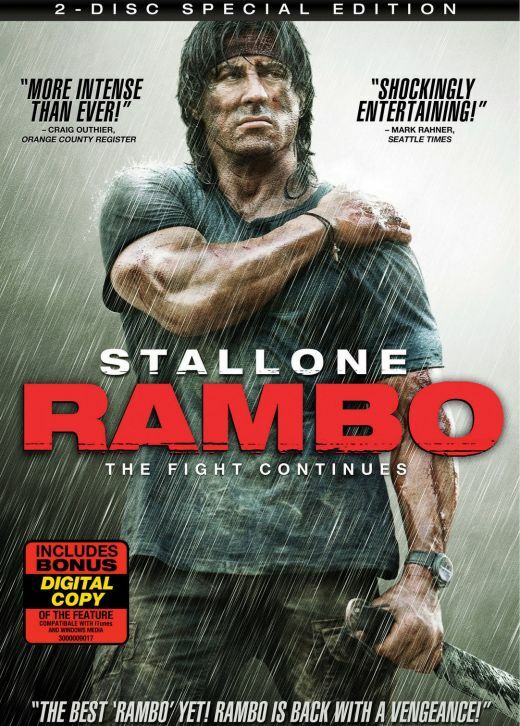 Rambo arrives on DVD in two different versions; a 1-disc, containing the film and the trailer, and a 2-Disc with many more bonus features. I’m reviewing the 2-disc version, and my very first thought is that the moniker “2-Disc” is somewhat misleading. Yes, this set does indeed contain 2 discs, but the film and all of the bonus features are on disc 1; disc 2 is more or less a Data DVD that contains a Digital Copy of the film that you can put on your computer and transfer to an iPod or similar MP3 device; but more on that in a minute. As I said, the bonus features are all on disc 1, and are fairly substantial, if not altogether numerous. First is an Audio Commentary with Sylvester Stallone. Stallone always gives a great commentary, and this is one of his best. It’s an essential listen because he provides the interpretation behind Rambo’s cold, silent stares, and other moments. He talks about the production and the choices he made about filming it; everything he says is cool to hear. Stallone has the kind of voice that makes you feel like you’re in the room, watching the movie with him while he tells you about the film. My only gripe with the commentary is that you have to find it from the set up menu, and not the bonus features menu. On the Bonus Features menu, the main attraction is the “Featurettes” section, which contains six mini-documentaries. The first, It’s A Long Road: Resurrection of an Icon (19:50) is a general overview of the production. It details how the project started and how the filming process went. We learn about Sylvester Stallone’s directing style, and why the entire cast respects him. Every tidbit divulged in this featurette is really cool to learn, and makes you want more. Next is A Score to Settle: The Music of Rambo (6:39), where Bryan Tyler, the composer, and Stallone discuss the music of the film. It’s also very good, and it too short at under 7 minutes. The Art of War: Completing Rambo Part I: Editing (6:45) introduces us to the editor of the film. While very interesting, we don’t learn a whole lot about the editing process; for instance, I would have enjoyed learning about the kind of program used to edit or teqniques the editor uses in cutting down the mass amounts of dailies Stallone turned in. The Art of War: Completing Rambo Part II: Sound (3:16) is very brief and barely talks about the sound effects; it should have been part of the editing featurette. The Weaponry of Rambo (14:22) actually discusses the props and the job of the prop master. It’s one of the most interesting features on the disc, and every second is intriguing and gives great insight into the making of the film. A Hero’s Welcome: Release and Reception (9:29) begins by discussing the premiere of the film, including footage of Gov. Arnold Schwarzenegger talking to the press about the film. They talk about the box office, and how it was negatively impacted by kids buying tickets to other movies and sneaking into Rambo. My only complaint about this one is that I would have liked to see Stallone address the negative critical reception. All 5 of these featurettes combined give a fairly good idea of the making of the film, and the best part is that Stallone is a constant presence. He’s a clear thinker, and has lots of good things to say. All this material is fun to watch, but if it weren’t for the excellent commentary, it would be too little. Luckily, when you combine it with Stallone’s audio commentary, you get an all-inclusive look at the making of the film. There’s one more featurette, though it’s unrelated to the making of the film. Legacy of Despair: The Real Struggle in Burma (10:40) features political experts and others discussing the war in Burma. This featurette is essential viewing; I’d recommend watching it directly after viewing the film, because it adds weight to the Burmese struggle witnessed in the film. I really liked how the featurette details how the film, and Stallone himself, are banned in the country of Burma now, and how the movie has became a source of inspiration for the rebel freedom fighters in the country. The next section of extras is the Deleted Scenes, of which there are 4. Do You Believe In Anything? (2:28); Who Are You Helping? (4:42); Boat Ride (4:11) and Let’s Keep Going! (2:20). All 4 are scenes of interaction between Rambo and Sarah the missionary, the first three from early in the film. The first three scenes are actually extended versions of scenes in the movie, and I think at least some of the dialogue here should have been used. The “Who Are You Helping?” scene features a phenomenal monologue from Stallone about war, and really would have added dramatic weight to the movie. Some of the dialogue here was worked into other sections of the film, but if Stallone ever does an extended/director’s cut, I would like to see this scene put in the film. The fourth scene deserved to be left on the cutting room floor, but all 4 are fun to see. Finally, we have the Theatrical Trailer (2:26). Trailers are always cool to have on the DVD, though I was never fond of this trailer. I really wish the “red-band” trailer, first shown at Cannes and then released on the internet over a year before the film’s release would have been on the DVD. At 4 minutes, this was a really well-built and fun to watch trailer that got the blood pumping spectacularly. The packaging for the set is great; the discs are kept on opposite sides of a clear, plastic digi-pack with a flap on either side with photos of the film; that is housed in a slipcase that is shiny and…well, cool. It’s creative packaging. The extras on the disc do not disappoint, and are worth the extra cash for the 2-disc version. The fact that you also get, via disc 2, a digital copy of the movie only adds value to the set. Is this the be-all, end-all special edition DVD? No, but everything is good and there’s plenty of it; not too much, and not too little to be skimpy. The extras are as enjoyable as the film, and that’s what matters. It’s a great action film that is made better because it has something to say, and examines the main character. The movie is very re-watchable, like the other Rambo films, so buying it on DVD would be the obvious choice for fans of the film. Lionsgate did a great job with the DVD, giving us great A/V quality and a batch of extras that are fun and informative. Throw in a digital copy, and you’ve got a set that delivers a bang (or maybe a decapitation) for your buck.